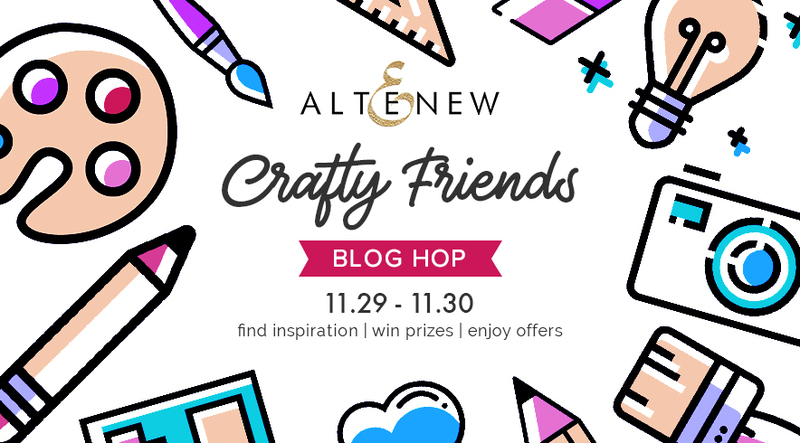 Welcome to the annual Altenew Crafty Friends Blog Hop! I’m so thrilled to be part of this wonderful hop alongside so many of my crafty friends and a company that I dearly love working with. Altenew established in 2014, just a few months before I started crafting, and I had been a huge fan and customer of their products from the very first day. 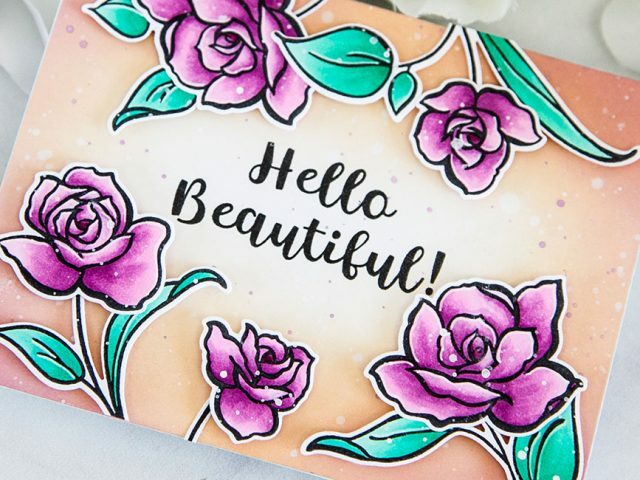 My first purchases from Altenew included the Painted Flowers, Vintage Roses, and Super Script sets, which I still use in my current projects to this very day! I’ll never let go of them. Fast forward a little more than 4 years brings us to today’s celebration of the growth, the success, and so many relationships built around Altenew. In honor of this event, I’ve created a bright and happy floral card to represent the brightness and positive vibe of this community. Altenew, you’ve made my crafty world brighter! 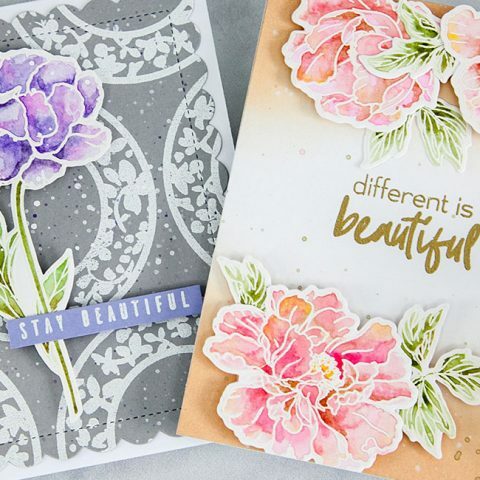 The floral set I chose to work with is called Life is Awesome and it is a floral layered stamp set. I love this set so, so much! And with my Altenew dye ink collection, I stamped these images with my stamping platform and die cut them out with the coordinating dies. For the reds, I used the Tea Party collection, which includes the colors Pink Pearl, Coral Bliss, Heartbeat, and Vineyard Berry. For the blues, I used the Deep Sea Blues collection, which includes the colors Sea Breeze, Turqouise, Tide Blue, and Starlight. My yellow flowers were stamped with the Summer Afternoon collection, which includes Buttercream, Warm Sunshine, Caramel Toffee, and Paperbag. And lastly, I stamped the greens using Frayed Leaf, Forest Glades, and Evergreen. I die cut an oval frame out of a piece of A2 sized white card stock to arrange my flowers around. Behind the window, I blended a background with Broken China and Tumbled Glass distress oxide inks, and then heat embossed my sentiment in the center in white. 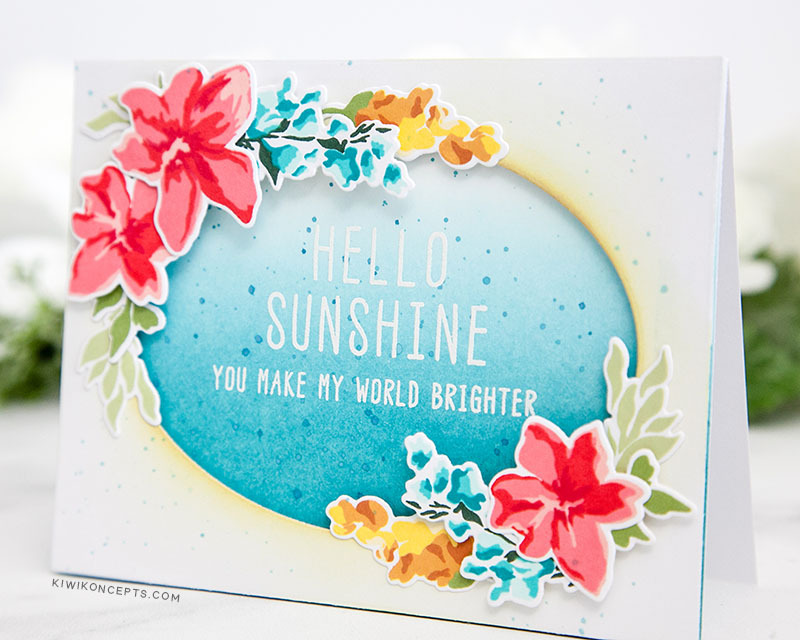 This sentiment is from the Hello Sunshine stamp set. To complete the card, I added a little glow to the border by blending the edge with the Warm Sunshine dye ink. Then I layered it on over craft foam, and added the flowers with liquid adhesive and foam squares. This post is part of the Altenew Crafty Friends Blog Hop! 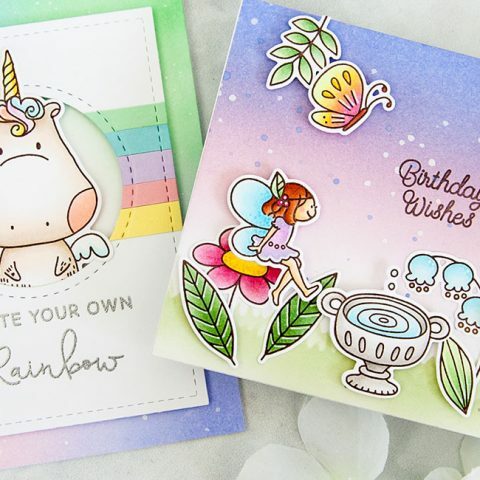 If you’ve been hopping along with us, you would have arrived here from Raquel’s blog and your next stop is the Butterfly Reflections Ink blog! You can find the full blog hop list or start at the beginning from the Altenew Card Blog. Be sure to leave comments by Sunday, December 9th, 2018 for a chance to win! 37 winners will be chosen at random from the comments left on all of the blogs in the hop and will be announced on the Altenew Card Blog and Altenew Scrapbook Blog on December 15th, 2018. Wait there’s more!! A winner will also be drawn for a $20 gift certificate to ONE lucky winner from this blog post! Please leave a comment on this post by Saturday, December 8th, 2018 for a chance to win. Winner will be posted in the Giveaways Page on Sunday, December 9th, 2018. UPDATE: Congratulations Patricia Mather! Please e-mail winner@altenew.com by 12/9/18 with the subject line “Altenew Crafty Friends Blog Hop Winner from Keeway’s Blog” to claim your prize! Enjoy some free US shipping or $5 off international shipping while you’re shopping with Altenew by using the promo code FRIENDS18 at checkout! The offer is valid from 11/29/2018 at 12:01 am EST through 12/1/2018 at 11:59 pm EST. Not valid on prior purchases. Cannot be combined with other promo codes. In addition, these ongoing promotions and new releases are worth checking out! Have you seen the recent November 2018 release? If you love stencils and ink sprays, be sure to take a look! Enjoy the great deals up to 45% off on select items in the Sale collection from now through 12/2/2018. Altenew has more amazing products rolling out very soon, and in the process they are clearing out older products. Check out the Clearance collection for last chance discounts up to 50% off! Once the product sells out, it will no longer be available. Keeway your card is so pretty! I love the way you created the window. I love the frame idea. Beautiful! Thank you! Thank you for sharing your talent. Lovely card! I just love the fresh, bright colors of this card! The flowers are just beautiful! Really pretty set. Painted Flowers was my first Altenew purchase too. love it still. Gorgeous color and such a happy card overall!! Pinned it for some tropical inspiration. I love the flowers framing the oval window you die cut and the colors are so cheerful! Love it! Hi Patricia! Congratulations, you’ve been randomly selected as the winner for the $20 gift certificate to Altenew! Please e-mail winner@altenew.com by 12/20/2018 with the subject line “Altenew Crafty Friends Blog Hop Winner from Keeway’s Blog” to claim your prize! Love this gorgeous card! The colors are so pretty. Truly lovely and elegant!! What a wonderful card! What lovely colors! Beautiful card. lovely card – love the graded blue colors in the oval! Your card is very neat and so pretty Keeway – I love the oval opening on the front with the tiny bit of ink blending around! Sweet card. I love the colors you chose and the way you recessed the ink blended center panel. Thanks for the inspiration! I always enjoy seeing what you have created for us and this is beautiful. The inspiration we receive from Altenew and all the crafty friends on this hop is totally amazing. Thank you! Your card is very pretty and inspiring! The colors of this card are so fun! Perfect for a friend or loved one .. in this case my little girl whose nickname is Sunshine .. I am just in love with this card!! I just love the tropical, happy vibe of this beautiful card! 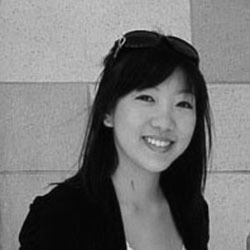 This bloghop is very inspiring! So many beautiful creations. Happy to be a crafter!!! Love how you used the flowers to frame the sentiment. I love the bright, cheerful colors of your card! Makes me happy just looking at it! Beautiful card. Love framed sentiment. Stunning work. The card is gorgeous. Beautiful card 😍 Thanks for sharing!!! always love your bright color choices. Very pretty. I love the simplicity this card exhibits. Such a bright, happy card! I really love the tropical look, and it’s refreshing to see a card like this in the midst of red-and-green holiday card season. The blue background really makes it feel tropical. Beautiful! The background is fun & creative, very cool! Your cards always impress. You do such beautiful work. I love the brightness of this card. 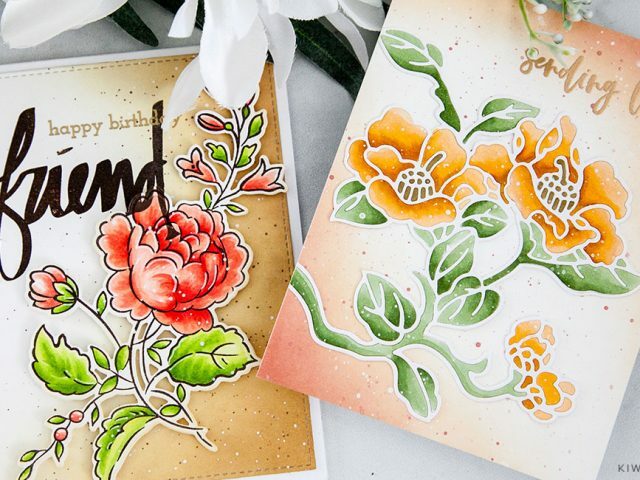 I love floral cards and yours is especially beautiful! Nice design and pretty colors. Your card is beautiful. The colors are perfect. Gorgeous card, I really like the oval window and its bright colours. Beautiful and I love all of the bright colors!! What a beautiful happy card! Very very lovely. I am really inspired to do something similar! Beautiful card, makes me think of summer days. Love this use of color combination and detail–from the ombre background to the subtle frame edging! Well done for a cheerful, bright greeting! Truly a beautiful card. Thanks for the chance to win. Loved your card, it’s so soothing. Beautiful card. Vintage Rose was my first Altenew purchase as well., It was my first experience with layered stamping. It was a gam changer for me. Thanks, Altenew. Ooooo, Keeway, I love these colors! So pretty and vibrant. 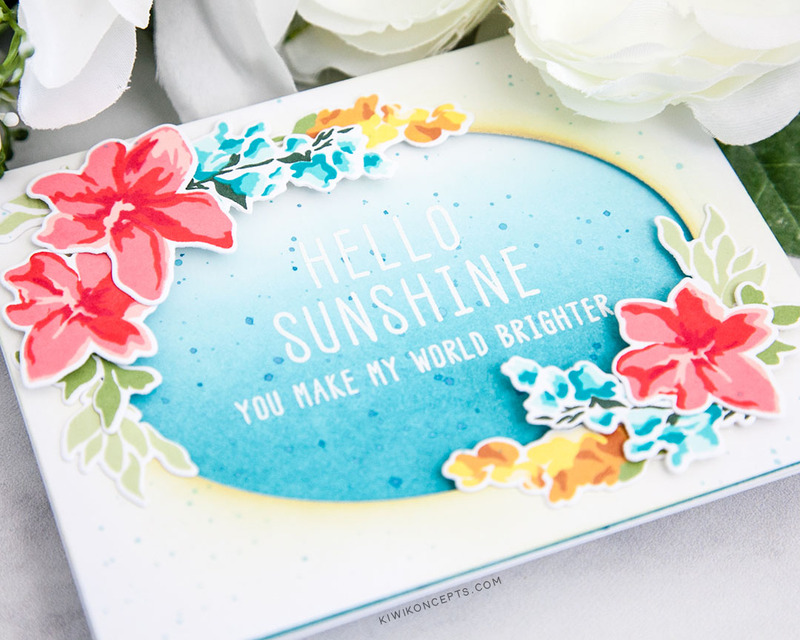 This is such a cheerful card – I love the vibrant colors! Such a beautiful card! I just ordered that stamp set. I can’t wait to get it. Beautiful card, I like the colors very much. 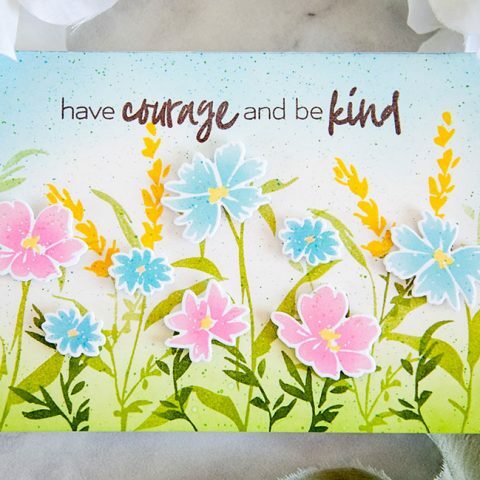 I like so much about this card – the layering and the background behind the sentiment are really gorgeous. Great story about your favorites from Altenew. I love the sentiment in the card you created. This is BREATHTAKING!! I Love the coloring and your color choices are just stunning! Great colors – feels summery. Beautiful frame image to highlight the sweet sentiment. I love the color combo you chose! And the little penguins are adorable! I love how the flowers frame the beautiful background and sentiment! Love the beautiful window frame you made. I love the beautiful colors in this card. Your coloring is outstanding. Your card is so pretty! Love the colors and design! So glad I found your blog!! Love your style! This is so pretty and cheery! 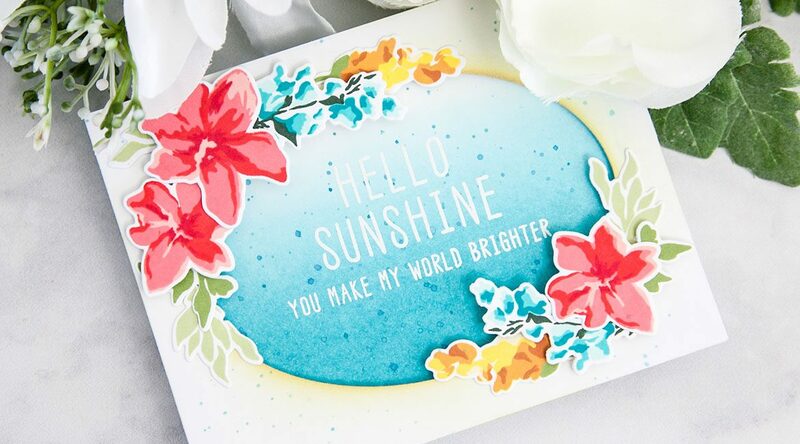 Lovely card…like sunshine on a rainy day. I love EVERYTHING about this card! Your style is beautifully striking! So we’ll done , love the painterly look ! Beautiful card Keeway. Thank you for sharing it with all of us. YES your card is very pretty and cheerful could be Altenew “poster child” LOL When I think of Altenew these flowers come to mind … They bring a smile ! There are so many things I love about this card. Have to try this technique. So beautiful!!! I love the framed sentiment and the blending!!! Beautiful, tropical colors are enhance your design! wow! I saw this on Instagram earlier and was just blown away. This card is amazing and the colors are perfect. I love your work. Thanks for your inspiration! Your beautiful flowers frame that so lovely! the whole card is pretty but I love the glow you got by coloring the edge of your cutout. I am going to borrow this from you. thanks. I love what you’ve done here. Great products as well. Thank you. Beautiful card with bright cheerful colors. Very creative. What an absolutely gorgeous card! Love everything about it from the soft blended background to your beautiful design ! Such a beautiful combination of colors – love the bright vibe and I do understand what you mean about falling in love with Altenew… I love Altenew too…. Love the color combo…so pretty! Stunning card. I love how the flowers are arranged around the oval and the colors you chose for them. Thanks for sharing your time and talent with us. Lovely card. The flowers are the perfect frame for the sentiment! Love the colors you used. So pretty and sweet! Love the colour you have added to the edge of the oval window. And the floral frame is gorgeous. Stunning card, love the colours and how you inked around the oval! Your card is inspirational and cheery!Thank you for sharing your techniques with us! I adore this card! The design is beautiful! What fun tropical colors! Beautiful! I love everything about this card. The beautiful colors, the background and the super sweet sentiment! A gorgeous card Keeway, the colours are so fresh and pretty. Altenew has made my crafting ‘brighter’ also since getting a number of their amazing floral sets. Love THEM! So pretty and colorful! I love how you highlighted the oval window too. 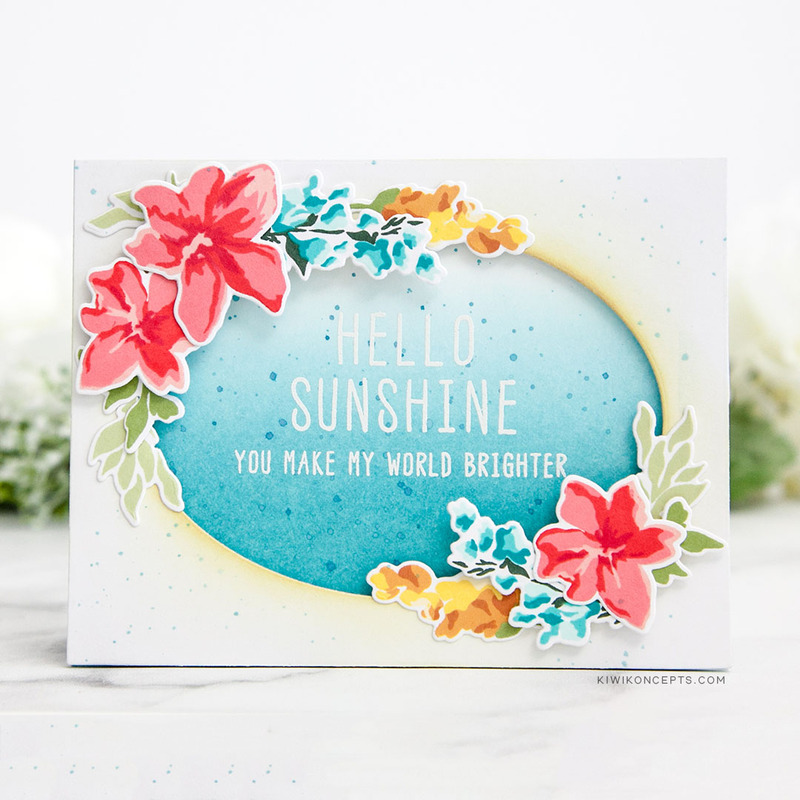 What a bright, soft and sun shiny card! Colors are so happy. Thanks for the inspiration. Thanks, this is so pretty! Very pretty card. Love the vibrant colors. Thanks for sharing with us. sky and the beautiful flowers. How beautiful is this! I am new to card making and love seeing the different color combinations crafters like yourself come up with. Thank you for sharing this post! It was very helpful! Great job on your card! It’s beautiful, and I love your choice of color. TFS–have a blessed day. two wwordsa… Lovely and pinning it! So pretty! I love how you framed the opening and how the blue fades out! This colorful card makes me want to get to a tropical location pronto! Thank you for being part of the blog hop! Wonderful card! It’s like a visit to a beautiful beach to escape the dreary weather outside. Right about now, in the middle of Christmas cards, it was refreshing to see the beautiful colors you used on your non holiday cards! I love the beautiful colors in your card! This design is so fresh and bright! 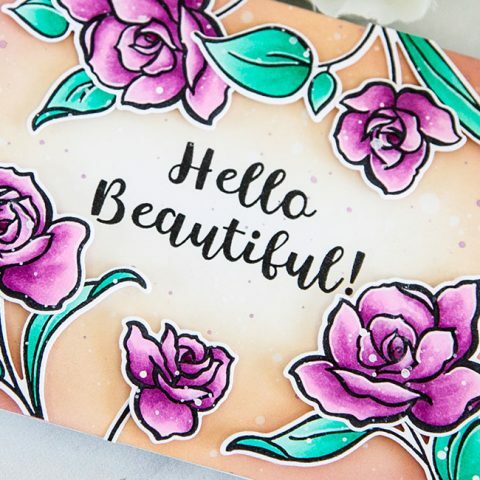 Beautiful card – I love how you added that gorgeous blue inking to the center panel – it is a lovely, fresh palette and the card is so bright and cheery. Such a beautiful card. I love the fresh color palette! Just beautiful!! And the blues that you chose for your flowers match perfectly (at least on my monitor…) with the those distress inks. What a gorgeous card! You’re right, it is bright and cheerful. TFS! It looks like some antique mirror. Beautiful! Loving the shading on the blue background window. Gorgeous frame with flowers. Love the frame and the vibrant colors you chose. Thanks for sharing. Thanks for sharing your gorgeous card Keeway. I love the oval cut out and the framing of it with your beautifully coloured flowers. Love your colour choices too. Very inspiring! Pretty florals …love the design with the blue oval. Very bright and pretty. Makes one feel uplifted! your card surely is full of sunshine in those lovely vibrant colors – beautiful!! Pretty bright and vibrant card with such a sweet sentiment! Love it! Beautiful card! 🙂 I love the colors. Sooo beautiful. You always create the most gorgeous cards! I love the beautiful burst of colors! Wintertime is so blah here in the Midwest and I miss the flowers and sunshine. Your card brought a little of that back and put a smile on my face. Thanks for sharing! So pretty, Keeway! I love the fresh color palette you chose! Enjoying the Crafty Friends blog hop! So many fabulous creations! Gorgeous coloring on these lovely flowers! Beautiful card! So many lovely colors, all combined beautifully for such a cheerful card. Pretty design.. love the who idwa of this card so fresh and breathy. Amazing as your usual. Your card is lovely. The florals look wonderful against that background and I really like the way you framed the oval cutout. AQnyone would love to get this card. I love this card! So fresh looking. Beautiful card. Your flowers are just lovely. Thanks for sharing. Such a pretty and unique card. Thank you for the inspiration! Gorgeous, Keeway, yet another fantastic design came from under your crafty hands! Thanks so much for the wonderful inspiration! Beautiful card, I love the colors you’ve used! I’m so taken with that blue speckled background… so like a robin’s egg! It makes the gorgeous flowers POP! Merry Christmas and beautiful design. What a pretty card! The glow is such a good idea, it really does remind me of warm sunshine! Merry Christmas. And what a beautiful card, wow you are talented. i really like this card that you have created, the yellow around the oval makes it glow! thanks for sharing. This card really does capture the happy, loving, supportive vibe of the crafty community. I love how you put this together, and the tips on some of the sets you’ll never let go of. Thanks for sharing your creative energy with us! Your card is beautiful! I love how you used the blues in the center with the golden color around the oval with the added floral element. Just gorgeous! So pretty! Love the coloring! An incredebly lovely card, great colour use and a card you can send to anyone. Thank you so much for sharing Keeway. Hi Keeway! You’ve out done yourself with this beautiful card 🙂 It’s so bright and upbeat! What a tribute to Altenew! Thanks for inspiring us!!! I love how bright and beautiful this card is! Thanks for sharing! I love the bright colors and the floral theme of this card. I’ve been so focused on the holidays lately and this is a breath of fresh air! Beautiful card !! Loved the color combo used and the design. 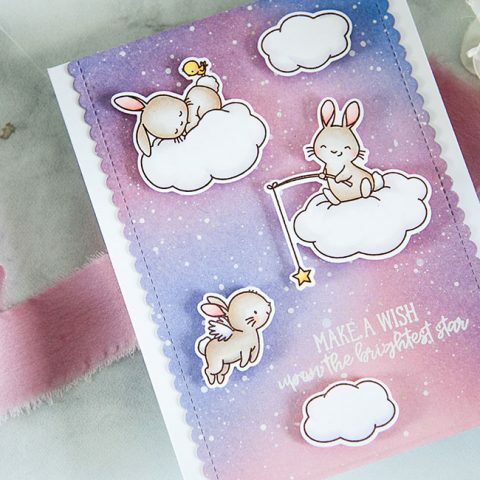 What a gorgeous card for the spring and summer! Love the oval cut out with the beautifully inked blue background. Very pretty colors! Nice framing of the oval with the flowers. Very cheerful and colorful!! I love the colors you chose!! I am trying to build up my Altenew products as well. I just received my watercolor set and watercolor markers. Fun fun fun!! Beautiful creation, I love how your framed the oval on 2 sides with the florals! Stunning card! I always forget to use my oval dies… going to go make a card from your inspiration. Thanks! 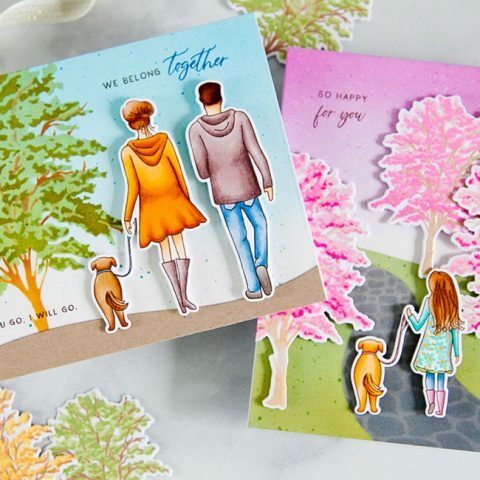 Your card is beautiful and so full of life and brightness, just like this amazing papercrafting industry! I’ve only been cardmaking/papercrafting for several months but have found everyone so helpful, sharing, and caring, I love it! Thanks for sharing your story, your card, and the always awesome inspiration. 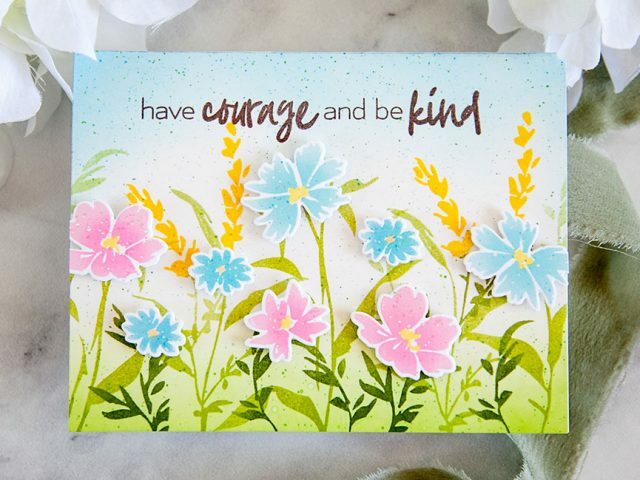 Love the explaination of how you chose to make this card…and I agree! Altenew has made my world brighter too! Love their products and the reason that they are doing the hop highlighting the wonderful crafty community! Love the way you framed the opening with beautiful flowers and the hint of sunshine! Pretty card, love the bright colors. Wow! Gorgeous card and fabulous colors! Thanks for the inspiration. Keeway, what a lovely design! I love the blended blue oval and the way the flower are used to frame it. So pretty!! So pretty! Love your coloring. Beautiful card! Love the design and your color choices; that blue is gorgeous. Thanks for sharing! Lovely framing of the sentiment on this gorgeous card. Thanks for sharing your creativity.